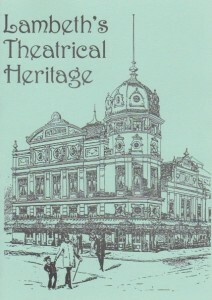 The article is reproduced from a 1991 booklet Lambeth’s Theatrical Heritage with the kind permission of the Streatham Society. Copies of this very interesting booklet are still available from the Streatham Society website. 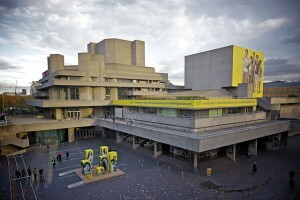 The concept of an English National Theatre was first proposed in 1848 by Effingham Wilson, a London publisher. He conceived its being created by public subscription to concentrate on the works of Shakespeare. Wilson’s idea was attempted by Sir Henry Irving at his Lyceum Theatre in 1878. Despite full houses, the venture was a financial failure. William Archer and Harley Granville Barker published a treatise in 1907 which galvanised actors, writers, critics and politicians into action. It was planned to open a theatre for the tercentenary of Shakespeare’s death, 1916, in Gower Street but the Great War intervened. A new edition of the book by Granville Barker in 1930 proposed a South Bank site. War intervened again, but afterwards the London County Council offered a site, and the Old Vic organisation lent its support. The National Theatre Bill was passed unanimously in 1949. Two years later a foundation stone was laid by Queen Elizabeth (the present Queen Mother), but the politicians had second thoughts, and the idea was nearly killed. Protests brought monetary support from the LCC and rent-free site. In 1962 a National Theatre Board was set up under Oliver Lytteton, joined later by Laurence Olivier. They decided not to wait for the construction of a new building but start productions at the Old Vic. They opened on 22nd October 1963 with “Hamlet” with Peter O’Toole. They were to remain there for 12½ years. Work on building the National Theatre started on 3rd November 1969 with Arts Minister, Jennie Lee, symbolically shovelling the first cement. Denys Lasdun was chosen as the architect The resuh was a large complex structure which included three auditoria, restaurants, foyers, wardrobes and workshops, art galleries, terraces, etc. Each of the auditoria is different, allowing productions to be staged suiting the needs of the director and the play. The largest is the Olivier, conceived in Ancient Greek style with seating for 1160 people arranged like a fan around a projecting stage. It has an enormous tower enabling sets for three productions to be flown out of sight The Lyttehon is more traditional with a proscenium arch. It is smaller, seating 890 in two tiers. Named after the Chairman of the South Bank Theatre Board, the Cottesloe is a much smaller, informal auditorium with an adjustable layout of seating. Some 200-400 can be seated, depending on circumstances, which include two tiers of wooden galleries resembling the inn-yards of pre-Shakespearean days. The whole building cost approximately £17M. When the National Theatre Company transferred to the new building, Peter Hall was appointed as Director, replacing Laurence Olivier, to much controversy. H.M. The Queen officially opened the Theatre on 25th October 1976, despite the building work not being completed, and the first production opening on 4th October. This latter was Marlowe’s “Tamberlaine the Great” with Albert Finney. The Lyttehon had opened earlier, on 8th March, with a series of transfers from the Old Vic, starting with “Happy Days” with Peggy Ashcroft. The Cottesloe opened 4th March 1977 with an 8½ hour epic called “Illuminations” by Ken Campbell. The policy of the National Theatre is to present the classic plays of the past in repertory with the best plays of the present, both from this country and abroad, with the top actors. It is the foremost theatre in Britain, receiving the accolade of being known as the Royal National Theatre on its 25th anniversary in 1989.